I conducted measurement-based studies of low-intensity energy sources for energy harvesting Internet of Things nodes, and examined the implications of energy source properties on the design of energy harvesting nodes and energy harvesting adaptive communication and networking algorithms. Indoor light energy: Using custom-designed measurement systems, we conducted a first-of-its-kind 1.5 year long measurement study of indoor irradiance (light energy). We demonstrated the feasibility of powering Internet of Things nodes using indoor light energy, and provided practical guidance for designing such nodes (e.g., determining appropriate solar cell and battery sizes). Energy of object and human motion: We conducted a measurement study of energy of object motion and long-term human motion (e.g., daily routines). We demonstrated the range of harvested powers for different participants and activities, and obtained insights into variability and predictability of motion energy harvesting processes. 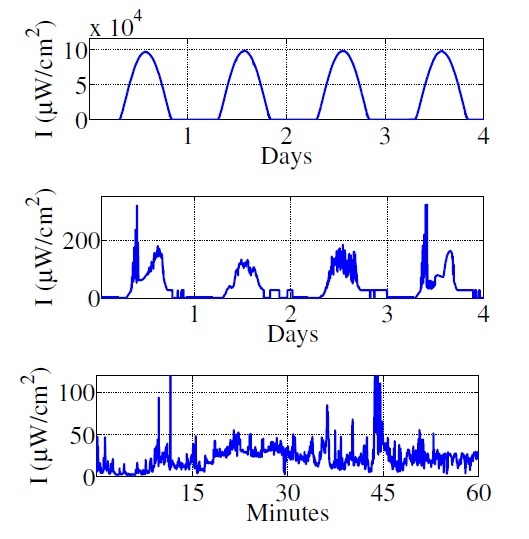 Armed with insights into variability and predictability (or lack thereof) of these energy sources, we formulated resource allocation problems aimed at allocating energy harvesting nodes’ time-varying energy in a uniform way with respect to time, and designed, developed, and tested algorithms for time-fair energy and data rate allocation. 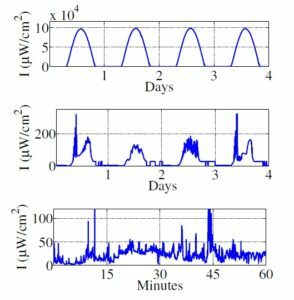 This work is the first to model nonlinearity of capacitor-based energy storage systems, and the first to examine analytically the impact of different energy storage quantization levels on the performance of energy harvesting adaptive algorithms. This work appeared in the Proc. of IEEE INFOCOM [paper PDF], IEEE WiOpt [paper PDF], ACM SIGMETRICS [paper PDF], and in the IEEE Journal on Selected Areas in Communications [paper PDF] and the IEEE Transactions on Mobile Computing [paper PDF]. The datasets we collected are available on CRAWDAD [kinetic measurements, light measurements] and on the Columbia University EnHANTs project website [kinetic measurements, light measurements]. The IEEE Transactions on Mobile Computing paper received the 2016 IEEE Communications Society Young Author Best Paper Award [receiving the award at an IEEE GLOBECOM award ceremony]. This work was profiled by the MIT Technology Review Business Report [article link], the MIT Technology Review Physics ArXiv Blog [article link], and the New Yorker Magazine [article link].